I wanted to find somewhere about halfway between Manchester & Suffolk to break up our drive and stop for a decent lunch. Thanks to Google Maps I knew I needed to be stopping around the Peterborough area so I reached for my trusty Good Food Guide and found a couple of suggestions. In the end I settled on The Olive Branch, a little country pub/restaurant in the tiny village of Oakham, just before Peterborough. It has a fantastic review in the Good Food Guide and has held a Michelin star for over 10 years, long before the recent trend of giving them out to pubs. 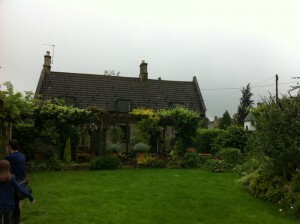 We arrived in heavy rain which was a shame as the village an grounds looked lovely. There is an outside seating area in the gardens which would be amazing to eat at in nicer weather. Inside was also very nice, a proper old fashioned traditional pub of which there are not enough of these days. The staff were very friendly but also professional and smartly dressed, giving the impression that although this is a pub and feels like a pub they treat the food as seriously as any restaurant. 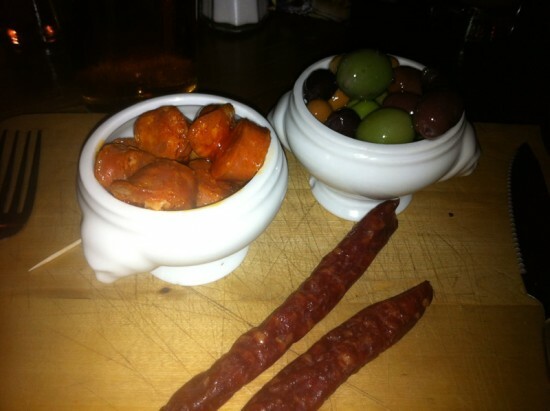 First we ordered the ‘Bar Board’ to start, a selection of bread, olives, chorizo & potato crisps. All were very good, particularly the chorizo cooked in cider which was fantastic. For my main course I chose the roast lamb. 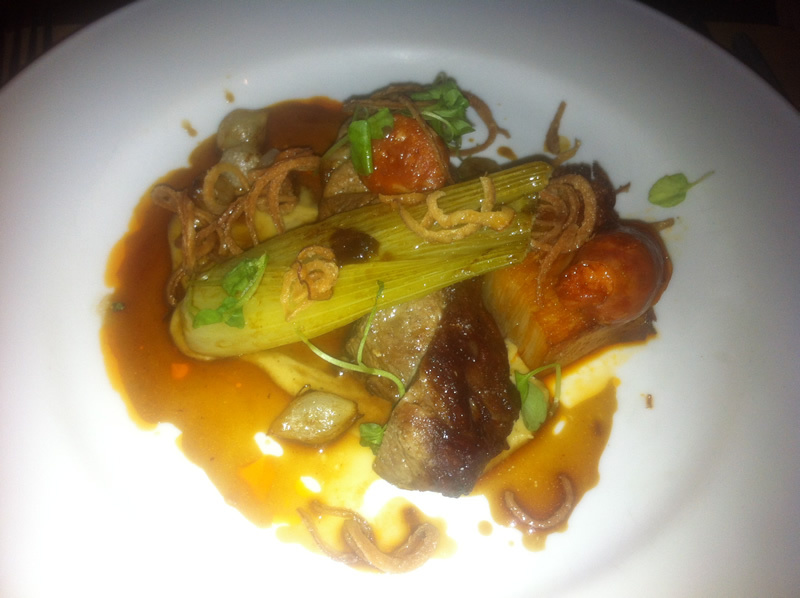 It looked amazing when it arrived, a really big piece of perfectly cooked lamb and a whole roasted fennel. Hidden underneath was a chorizo potato gratin and spiced aubergine. The flavours worked perfectly, particularly the aubergine which gave a delicate heat to the dish. My partner ordered a fish dish. 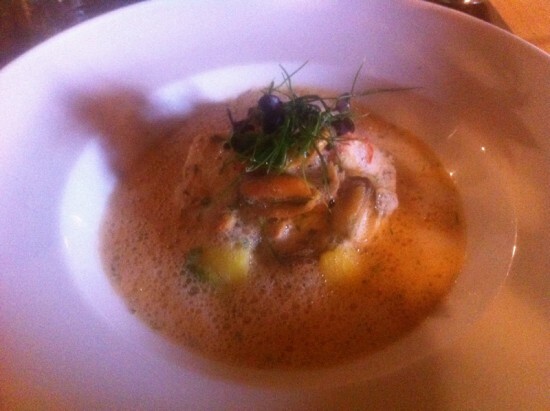 Pan fried fillet of Halibut with saffron potatoes and a ragout of shellfish which contained langoustines, mussels and clams. It also looked very attractive, the halibut was perfectly cooked, the broth really deep and delicious with bites of shellfish here and there, a very good dish. Desserts were not quite as successful but for me at least it was my own fault. I ordered the treacle tart assuming that it would be made with golden syrup. However this one arrived not looking light golden brown colour but very dark, almost black. My heart sank when I realised that it must be made from thick dark treacle which i’m really not very fond of (except in treacle toffee for some reason). 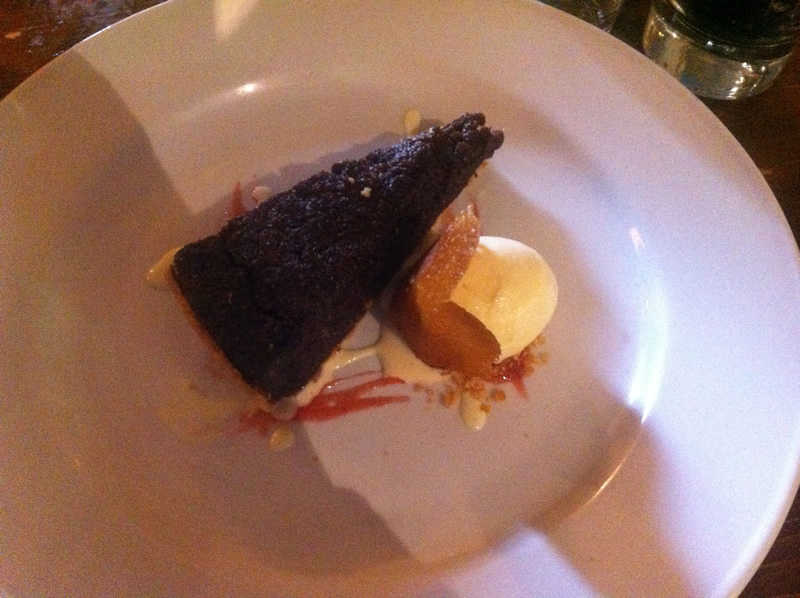 I decided to keep it anyway and whilst I could tell that it was a really good dessert, with perfectly light and crumbly pastry and a soft sweet filling the fact that I don’t particularly like the flavour of treacle obviously took away from my enjoyment a little. My partner ordered one of her favourite desserts, eton mess. It was raspberry & passion fruit eton mess which sounded amazing. 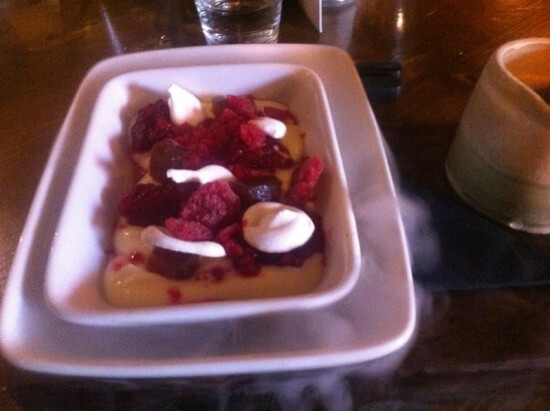 It came with a bit of theatre too as the staff poured dry ice around it to make a cloud of smoke. Unfortunately the dessert just didn’t live up to it’s unnecessary entrance. It tasted good but it was very small, literally 3 or 4 spoonfuls at the most. Served as a single layer in a small dish it contained about 2 or 3 tiny meringues a bit of fruit & some cream. It was gone within seconds. I don’t know how much dry ice costs but I’d much rather however much they spent on it went into adding more to the dish rather than dressing it up. It was really the only downside to an otherwise fantastic lunch. The quality of food is great, it’s good value and in a very nice location. If I lived closer I would definitely be a regular and I hope to return someday.